This time Our Favourite features the record of the water wheel(s) in the former West Mill in Belper. 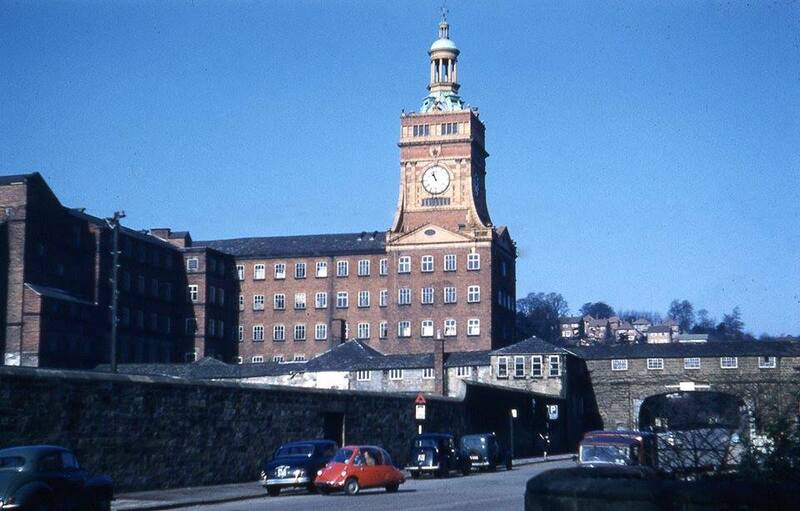 Constructed in 1795 The West Mill was the largest of the Strutt’s mills in Belper until the construction East Mill in 1911. Readers may be able to recall the West Mill for its clock tower, although this was a much later addition, added in 1897 to mark Queen Victoria’s Diamond Jubilee. 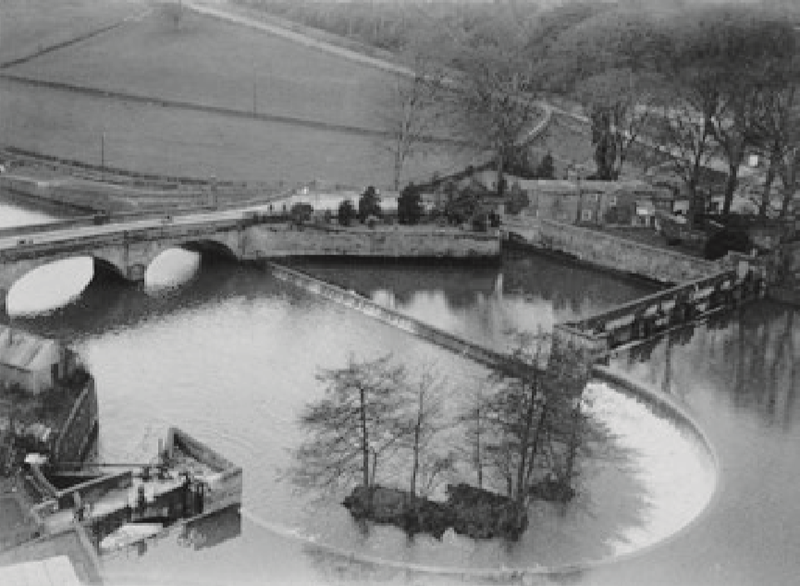 The West Mill originally had two water wheels, each 12m (40 ft) in length to power all of the machinery in West Mill along with the other adjoining, mills. The water to drive these wheels came via a water channel, or leat, running from above the horseshoe weir, behind the North Mill, under the road and then under part of West Mill where the wheels were located. As the smooth and continued running of the mills depended on the waterwheels to supply power to all of the machines. Any stoppages would have a negative effect on the productivity of the mill and had to be accounted for. The water wheels operated for 12 hours a day for 6 days a week, 72 hour per week in total. 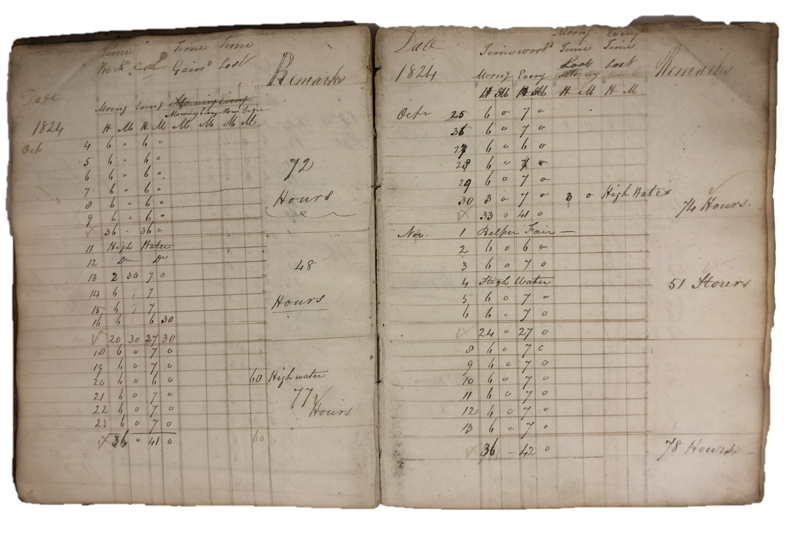 Logbooks were kept by the mill’s overseers to record the number of hours of operation each day and the reason for any stoppages. 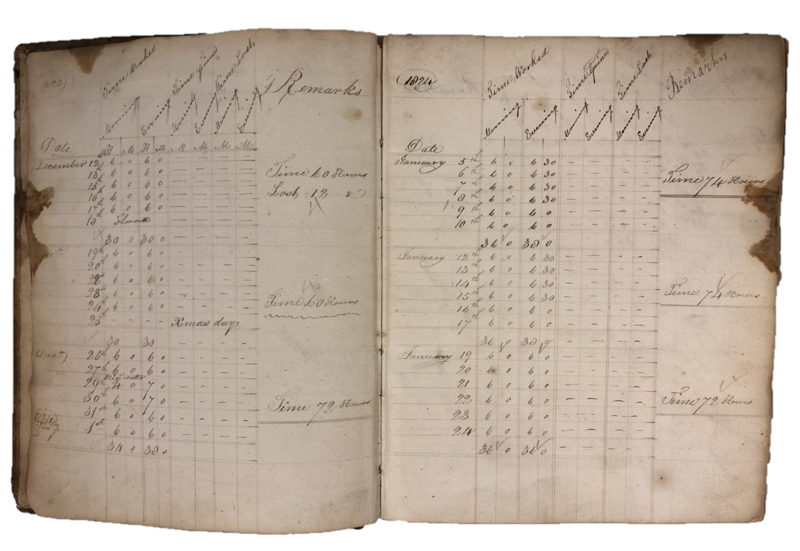 One of these log books survives in the collection of Strutt’s North Mill in Belper and Belper North Mill Trust Secretary, Rosemary Annable as her favour object in the museum’s collection. This small volume is what archivists call an ‘estray’ – a lost sheep – a record that has become separated from the series of which it was once a part – a document ‘not in the custody of the original records creator or its legal successor’. And yet by a remarkable accident of fate it has been returned to the site where it was created – given to the museum by a collector of all things to do with water wheels who, when he purchased it, had no idea which ‘West Mill’ it came from. Like many business records the volume does not include the name of the company or its location. 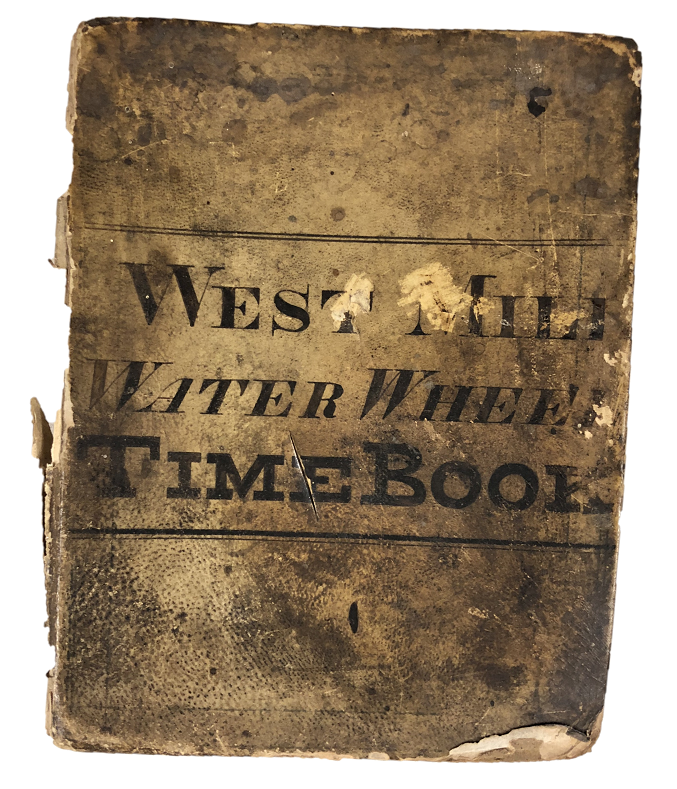 The front cover reads ‘West Mill Water Wheel Time Book’ and the book records the period from Friday 12 December 1823 to Friday 13 June 1834 with a daily record, in hours and minutes, of ‘Time Worked’, ‘Time Gained’ and ‘Time Lost’. The contents seem very ordinary – even boring – but for the researcher this is precisely the sort of record that can provide so much information, because when we look at it carefully we see not only the day to day routine – but the variations to that pattern, so carefully noted by the record keeper. At the West Mill the regular rhythm of work was twelve hours a day– six hours in the morning and six in the ‘evening’, for six days a week with no work on Sunday. There were four annual holidays: Christmas Day; Whit Monday (with a late start the following day, working only three hours in the morning); the Wakes, or ‘Belper feast’ in July (one day in 1824 but later extended to two) and the Belper fair in November. When Christmas Day fell on a Sunday no additional day’s holiday was given. Occasional stoppages due to variable water supply, ‘High Water’ and ‘Flood’, were few and the hours lost were quickly made up, although there was an unusual prolonged period of almost five weeks in July to August 1826 ‘short of water’. Deviations from normal working hours were recorded in minute detail and even more minute handwriting, noting the exact times when the wheel was ‘stopd’ or ‘came in’ and ‘gave over’. There were occasional hours of overtime for working the carding rooms, but not very many. Tables showing the hours the wheel was in operational each week with hours lost to floods and Christmas day recorded. Mechanical breakdowns were few with little time lost, a reminder that the mill work force included all of the trades required to construct, run and maintain its machinery. On 25 June 1824 16 minutes were lost when the ’wheel broke in the wheel house’ and later that year, on Thursday 24 September, the record keeper noted ‘Lost 25 minutes in consequence of wheel breakg in the Reelg Mill’. Detail was important. By 1831 ‘Time Gained’ was being recorded in minutes per day. Harnessing power and quantifying time were essential to productivity and commercial success. For me this small volume with its precise record of ‘Time Worked’, ‘Time Lost’ and ‘Time Gained’ through the action of the west mill water wheel is not just a statistical record. It speaks of two of the great drivers of the Industrial Revolution – water and time. The hours the wheels operated during October and November 1824. Despite work hours being lost to high water during the subsequent weeks have longer operating hour to make up for the lost time and output of finished cotton.